Wow, another long lapse. Sorry! I think I have Spring Fever! Haven't been stamping at all, but have spent some time today looking around for inspiration, so maybe I can get motivated! The other good news is it's too cold to do any outside work today! I've been working on sprucing up the yard for Spring, but that's probably going to have to wait a few more days. Anyway, thanks for stopping by and here's a project from my club meeting last week! These ladies are great inspiration for me, and the only stamping I've done in the last month!! There are two versions here, and they actually started in the garden department at Wal-Mart. I was walking through and found some great seed packets for 20 cents! 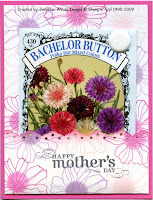 I grabbed a handful knowing I could make these great pocket cards and that they would be perfect for Mother's Day! I have done these cards in the past, but it had been a few years. The first uses a packet of Bachelor Buttons. I was able to use the same base color for the two versions. The card base is a regular card out of Pink passion. I then cut a piece of white long enough to fold over the top pocket. We punched the top edge of the pocket with the Eyelet Border punch. The Happy Mother's Day is stamped in Basic Gray. We then took the flower image from Fifth avenue and stamped it randomly in coordinating colors, Pink Passion, Lavender Lace & Pink Pirouette. We used a dauber to add the color in the center of the flower to look like the Bachelor Buttons on the seed packet. I sponged some Pink Passion on the top of the pocket and attached the sides with two mini glue dots. Attach the white to the card front and insert seeds! 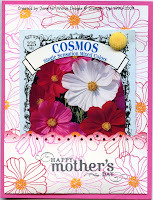 The second uses a packet of Cosmos flowers. Same basic card, just slightly different colors. This one used Pink Passion, Real Red & Pixie Pink with Summer Sun markered in the center of the flowers. I like things to match so I made the stamping match as closely as I could to the seed packets! LMK if you have questions! Thanks all! This is really adorable!!! What a creative and clever idea, thank you for sharing!! !